IMPORTANT NOTE: Devumi is no longer providing any SoundCloud services. While they used to be one of the best, there are still quality options on our Top 10 SoundCloud Provider List. 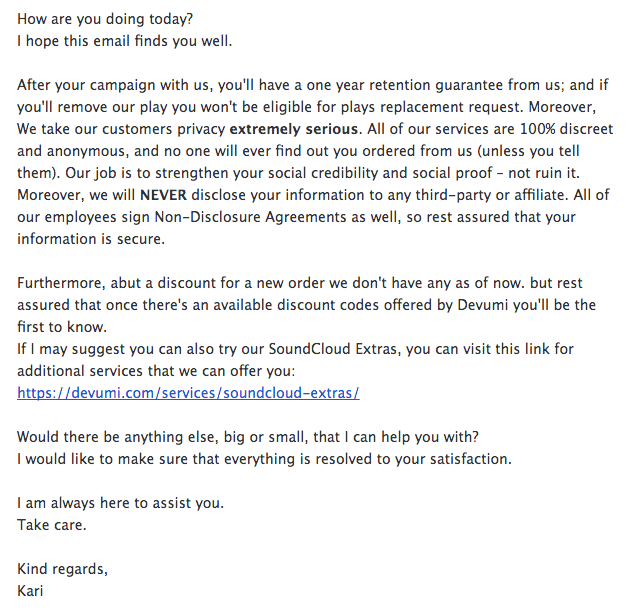 Devumi is one of our top-rated providers, and they didn't disappoint when we ordered 5,000 SoundCloud Plays from them. Our order came on time, and we received almost twice the number of Plays we ordered. Their customer service was responsive and helpful, and they have good protections in place for customers. Overall, Devumi is definitely a recommended provider for any musician looking to rise in the ranks. Devumi is a social media marketing company known for their high-quality boosting services. Dedicated to helping people kickstart their social media campaigns to success, they offer a number of services for Twitter, YouTube, SoundCloud, Pinterest, Vimeo, Vine, and LinkedIn. They are located in New York City, and have been in the business since 2010. Overall, they are one of our top-ranked providers, and we recommend you use them to improve your social proof on SoundCloud. Devumi provides SoundCloud services like Followers, Plays, Likes, Reposts, and Comments. Get the chatter going and avail yourself of Devumi’s Comments add-on. Get up to 100 comments for plans of 5K to 250K Plays, and up to 200 comments for 500K and 1M plans. You have the option to write your own comments, or let real users give you “genuine” ones. Price depends on the number of comments you choose. Have popular influencers promoting your track when you buy Sponsored Mentions on top of your Plays order. Get from 2 to 18 influencers promoting your music, letting you reach 25K to 1M fans depending on the option you choose. Available for Plays plans of 5,000 to 250,000. Customized Extras are only available for Play plans of 500,000 and 1,000,000. Fee depends on the particular option you choose. You can add more Likes, Reposts, Comments, or Followers to go along with the free likes and reposts you’ll get with those plans. We reviewed the terms and conditions sections on the Devumi website and made a few comments on their status below. To find out more details on these, then please toggle the sections to see what we thought! Devumi has a standard Terms of Service. You may not run other marketing campaigns while your Devumi marketing campaign is running, or you’ll forfeit your right to a refund. Cash and check payments are not eligible for refunds. The company will keep all information you supplied them confidential. Devumi has a 100% Money-Back Guarantee if for any reason you are not satisfied with their service. They offer a full and partial refund for a period of 30 days. Devumi has a Retention and Replacement Guarantee in place, if for any reason you lose Plays they delivered. They offer 365-Day Retention Guarantee for SoundCloud Plays. The Retention Guarantee is void if (1) the customer ordered from a different provider at any time, (2) the customer’s account had experienced a reduction in Plays before ordering from Devumi, (3) the customer made their tracks private or changed their usernames during the campaign, and (4) the customer deleted the Plays they got from Devumi. Contact details for Devumi aren’t very obvious, but you’ll easily find them if you look. There’s a Contact Us link at the very bottom of every page. Before ordering, we sent a set of questions to test their customer support. It was pretty easy to get ahold of them overall, and they answered very quickly - in about 30 minutes. As you can see, they gave a very friendly and helpful response. They answered our questions well, and provided a link to learn more. "Every information that you submit to us regarding your order are completely confidential. 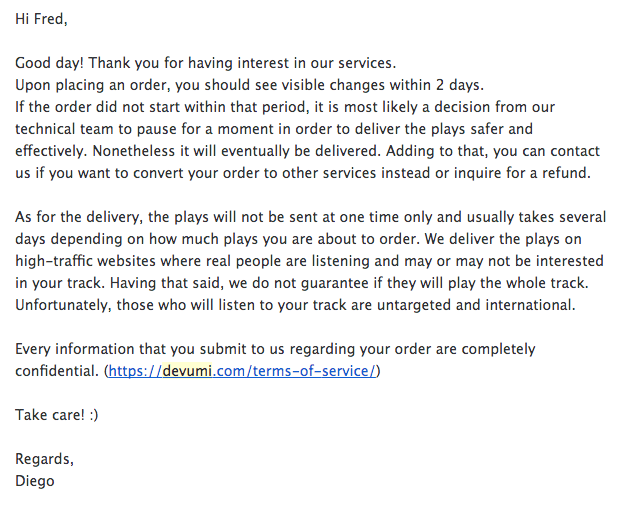 (https://devumi.com/terms-of-service)"
"... usually takes several days depending on how much plays you are about to order." "... you can contact us if you want to convert your order to other services instead or inquire for a refund." "As for the delivery, the plays will not be sent one at a time only and usually takes several days depending on how much plays you are about to order." "We deliver the plays on high-traffic websites where real people are listening and may or may not be interested in your track." After ordering, we sent another set of questions to test their response to a paying customer. Once again they answered very quickly, within a couple hours. As you can see they were very helpful, describing in detail how they keep customer data private. They also say we’ll be informed of any discounts down the road. "Every information that you submit to us regarding your order are completely confidential. (https://devumi.com/terms-of-service/)"
"After your campaign with us, you'll have a one year retention guarantee from us; and if you'll remove our plays you won't be eligible for a plays replacement request." "Furthermore, about a discount for a new order we don't have amy as of now. But rest assured that once there's an available discount code offered by Devumi you'll be the first to know." We recommend the services of Devumi to any musician, young or old, experienced or not. These services are especially helpful to kickstart your popularity and gain more social proof. As you can see we began receiving Plays within a few days after ordering, and we quickly passed the 5,000 mark. IMPORTANT NOTE: Devumi is not providing SoundCloud services anymore. While they used to be one of the best, there are still quality options on our homepage of the best SoundCloud Provider List. As you can see, Devumi over-delivered by quite a lot, and provided a great overall experience. We ordered 5,000 Plays, along with the free likes and reposts, and we got more than expected. We received over 9,000 Plays in total, around 30 likes, and 7 reposts. Customer support answered our questions quickly and in a friendly manner, providing a helpful link to more info. Overall, we recommend them if you want to buy SoundCloud Plays from a great company at a great price. Soundcloud and Twitter services work in tandem like a social magic wand. So, this one is going to be a doozy of a long one, but I promise it's worth your wait. Sorry, I am filled on BIG-A right now so my attention span and focus is literally off the charts at the moment, and I'm sorry if this is too long, but if you really want to know my personal experience with Devumi then this is for you. OK, let's dive right into this.First, I started off this journey looking for a fast, cheap, and effective way to either growth hack the bejesus out of myself or find a cheap way to do something similar. I came across the very idea of buying SoundCloud plays and followers somewhere on the internet, so I started looking for reviews and other peoples experience with this whole process. Essentially, I found a lot of similar stories, essentially saying "Yes, it can work" but it really depends on who you buy from.I ended up on another part of this website and found myself most comfortable with trying this out on Devumi, as they have been around the longest, and the few negative reviews I did find are so ridiculous and outrageous, it seemed more likely that they were fake negative reviews made by their competition.Second, I started out with a really small order. I literally spent $10 on Soundcloud plays and then I waited to see if they rolled in. Sure enough, they did deliver 100% and it was great! But, this is still a small amount, perhaps they will have difficulty in dealing with higher numbers? Next, I spent about $50 on more plays and some followers. Once again, they delivered and I was pleasantly surprised at the quality, speed, and overall experience with it. Also, at this point, I found a coupon online and saved 10% of that $50 so that is even cooler. I waited about 1 whole month before trying again with an even bigger order. I have a lot of content that needs Devumus attention so that's perfectly OK.Then, I decided it was time to flip the script a little bit, as I now knew that they could deliver on Soundcloud, but can they do the same on Twitter? Most people probably think they are one in the same, but that could not be any further from the truth. So, I got the URL for my Twitter profile and placed my first TWittre profile. I went ahead and got 5 thousand Twitter followers, and sure enough, like the previous experiences I had with Devumi, they delivered above and beyond what I was expecting!The twitter followers were just as real as the SoundCloud followers and plays! In fact, each Twitter follower had their own profile pictures, unique bio's, and even links from the Twitter account to relevant content and pictures that match the same from their profile and media gallery. It's as if they either made a truly unique way of getting real people to follow suggested people, or they are running the best and most organic bot farms ever,So, the followers were great and blew me off my seat, but the next part is probably my personal favorite: Automatic Engagement.So, they have this side service called Automatic Engagements. It makes every tweet you get automatically likes and retweets within minutes of sharing! It literally makes you look like you have a highly active and involved audience and fan groups on Twitter!THE BEST PART: the automatic retweets and likes PUSH your tweets up the chain of whatever hashtags you use! If you tweet using the biggest hashtag of the day, and you have a big retweets plan, you can CONSISTENTLY get to the top of the biggest Trends and get seen by MILLIONS of people on a daily basis! It's truly unreal! I know a lot of this is all about Social Proof, but this is insane... it's powerful... and it's automatic.So, on my most recent encounter, I had to place a massive order for my newest SoundCloud upload. It was over one thousand dollars, so I was rightfully nervous. However, the actually delivered this too! The thing I bought was so big it took a few days to organically flow in, but it was great!What are the bigger social economic effects of this entire industry? I don't know. I also don't know whats going to happen before all of this is so popular that everyone is doing it? I think we are already looking at it. I think a lot of people, and certainly, every politician, artist, and marketing guru have spent at least some time buying followers and engagement for the businesses their own business profiles.At the end of the day, Devumi has consistently delivered everything I bought from them, and they have really made a huge difference to my life. Social proof is what they sell, and they do a great job at it. In my little world, my conversion rate is tied to getting people to listen to my music, and people are always more comfortable doing that when they arent alone. Yep, I am officially looking like a Rap god now with their s*** from devumi, They got me a metric f*** ton of soundcloud pimpin asss followers and plays. Seriously, I cant believe it was that easy. I guess if I am smart enough to think of "hacking" my soundcloud by buying followers and plays, there are people smart enough to figure out a way to sell it and deliver it. I will be throwing a lot at this until I get big or until they fail to deliver. So far so good. This review is spot on.